When Jackpot Cafe was rebranded in June 2014 they decided to close their affiliate scheme. For this reason we have chosen to redirect our readers to a brand using the same software which has the same gaming experience to offer, Jackpot Liner. 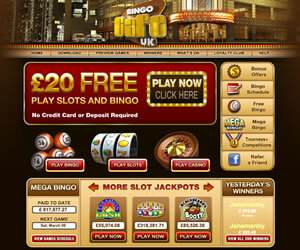 Jackpot Cafe is one of a number of sites that run on the unusual Leapfrog Gaming software. It allows for an exciting and different bingo gaming experience that incorporates a 3D virtual environment and so is a little bit different to the regular bingo sites out there. On visiting the site homepage, you get the impression that Jackpot Cafe is more like an upmarket casino than a regular bingo site and this adds an air of trust and intrigue to the site. Registration is quick and straightforward and all members are treated to a no deposit welcome bonus, as well as further deposit bonuses once deposits are made. More like a casino than a bingo site, you do need to download the Jackpot Cafe software to enjoy the gaming but it's a quick and easy process and once it's completed, you don't need to do it again. Once you're inside, you'll see why the download was necessary as the gameplay interface is simply stunning. In utilising 3D gaming software, Jackpot Cafe creates a virtual café environment for members to enjoy and each player is given their own interactive avatar figure to customise. Each bingo room is accessible via its own door and each doorway is complete with information regarding ticket prices and jackpots available in that room. Unfortunately, the bingo available at the Cafe is limited to 75 and 90 ball but with such an interesting and original gaming environment, most players won't feel like they're missing out. The site also offers Mega Bingo, which is their answer to progressive gaming, with a minimum £500 up for grabs in each game and there are also free games scheduled intermittently and announced by the friendly Cafe chat hosts. 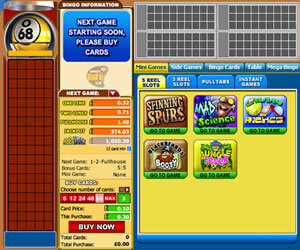 A range of side games tops up the bingo on offer, with multi-reel and regular slots being particular popular. You can play any side games alongside your main gaming and enjoy the quick thrill that comes with it. The casino games on offer also include standard casino table games such as Black Jack and a range of instants to keep you entertained between calls. Like all decent bingo sites, Jackpot Cafe offers some huge progressive slots jackpots in games such as Pyramids Cash and Blackbeard's Booty. Jackpot Cafe also performs well when it comes to bonuses and promotions. In addition to a fantastic package for new members, the site has regular promotions on a weekly basis with guaranteed jackpots and exclusives scheduled throughout the year to look out for. Prizes range from huge money jackpots to gadget and gift prizes which are always fun to win. Although some players may be put off by how different Jackpot Cafe is from regular sites, they shouldn't be. The simple software download and virtual environment created are great fun and make playing at the site exciting and different. What's more, the no deposit bonus gives you ample time and money to try out the site and realise it has some truly top features, so you genuinely have nothing to lose. Jackpot Cafe currently offers 75 ball pattern games and 90 ball bingo. 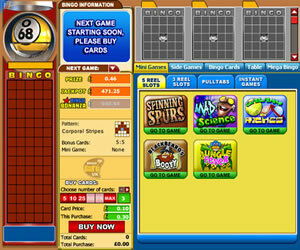 Alongside this are a selection of mini games available as part of the bingo window. In addition there are also a number of slot games and casino style games available that are played in a different gaming window. Should you accept any of the bonuses offered by Jackpot Cafe then you are required to meet wagering requirements of 3x the amount bonus received if playing bingo but 10x if slots are being played. You do have the option not to receive the bonuses offered though.